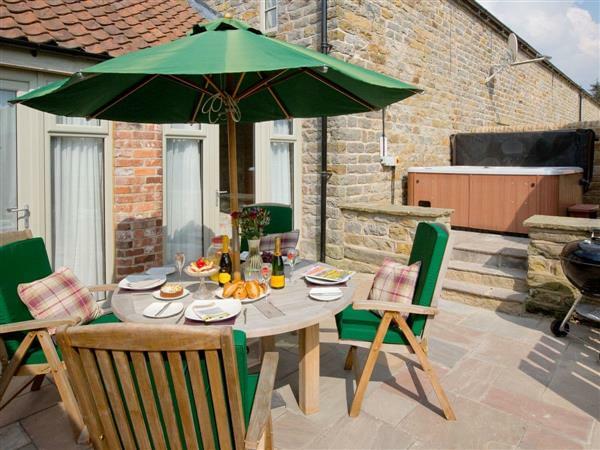 Willow Cottage at Thirley Cotes Farm Cottages in Harwood Dale, near Scarborough, Yorkshire sleeps 4 people. 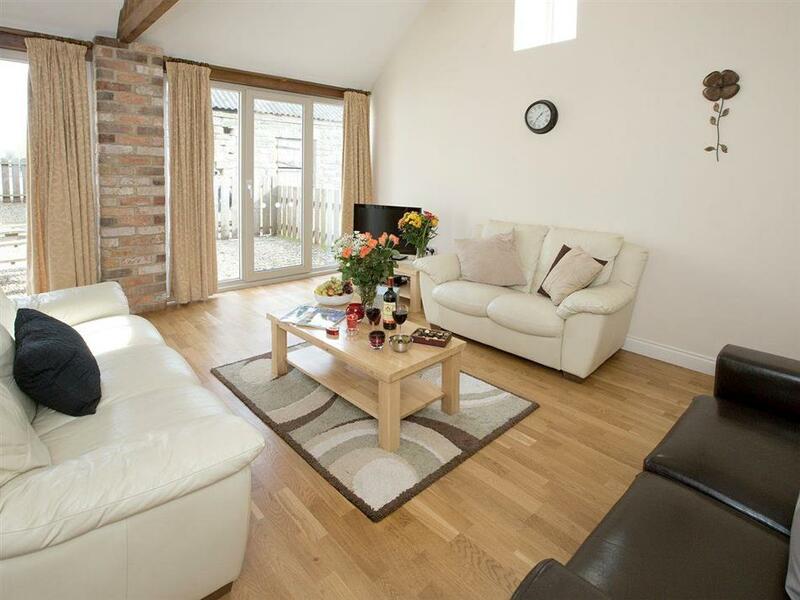 Willow Cottage is a single-storey terraced barn conversion and was formerly the cart shed. It offers open plan living accommodation all on the ground floor. In the grounds at Thirley Cotes Farm Cottages near Scarborough, there is a play area with swings and slide for under 12 year olds who must be supervised. The beach is 4 miles, with the shop 3 miles, and the pub & restaurant are 1½ miles from Thirley Cotes Farm Cottages near Scarborough. Willow Cottage can be booked together with Holly Cottage (ref UK2235 [Holly Cottage]), Sycamore Cottage (ref UK2236 [Sycamore Cottage]), Thirley Cotes Farmhouse (ref UK2237 [Thirley Cotes Farmhouse]) and Oak Cottage (ref UK2238 [Oak Cottage]) to sleep up to 28 people. Ground Floor: Willow Cottage is all on the ground floor. Open plan living space: With vaulted beamed ceiling and wooden floor. Living area: With electric stove, 32 Freesat TV, DVD player, Blu-ray player, iPod dock, CD player and patio doors leading to courtyard. Dining area: With patio doors leading to courtyard. Bedroom 1: With double bed and patio doors leading to courtyard. Bedroom 2: With twin beds and patio doors leading to courtyard. Air source underfloor central heating, electricity, bed linen, towels and Wi-Fi included. Travel cot, highchair and stairgate available on request. Welcome pack. External games room with pool table, table hockey and table tennis (shared with other cottages). External utility with additional freezer space (shared with other cottages). 4-acre woodland. Grounds with children’s play area, patio, garden furniture and barbeque (shared with other cottages). Lawned area with hot tub for 6 (shared with other cottages, time restrictions apply, over 16 year olds only). Bike store. Private parking for 1 car. No smoking. Please note: There is an unfenced stream in the woodland. There is a fenced pond in the grounds, 500 yards. Holidays at Willow Cottage, Thirley Cotes Farm Cottages run from Saturday to Saturday. Pets allowed at Thirley Cotes Farm Cottages - Willow Cottage. For a better idea of where Thirley Cotes Farm Cottages - Willow Cottage is, you can see Thirley Cotes Farm Cottages - Willow Cottage on the map below. Thirley Cotes Farm Cottages - Willow Cottage is in North Yorkshire; should you be on the lookout for a special offer, you can find all the special offers in North Yorkshire. It's always worth checking to see what is on offer at the moment. Do you want to holiday near Thirley Cotes Farm Cottages - Willow Cottage (UK2239), you can see other cottages within 25 miles of Thirley Cotes Farm Cottages - Willow Cottage; have a look to find your perfect holiday location.